to our seafood dock right here on Summerland Key's Fishery Row. Open to walk-in sales - we will gladly ship any of our products. Call or email and order. The Summerland Seafood Company will ship all of your seafood favorites! Everybody loves fresh shrimp. We have all sizes - fresh frozen & ready to ship overnight from our dock to your front door. Try our cocktail sauces. We can add to your shrimp order. 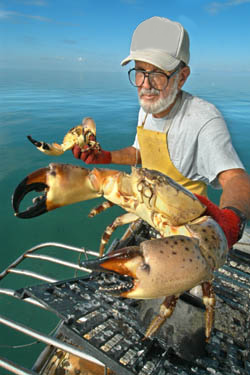 The secret delight of the Florida coastline - stone crab claws with some butter or mustard sauce is sheer heaven! Located on Fisherman's Row in Summerland - we get fresh shipments of shrimp and fish daily. Get ready for your next office party, game day with the gang or family celebration with the finest and freshest Florida Keys seafood available. We receive fresh fish right at our dock on Summerland Key's fishery row. Stone Crabs are IN 10/15!